The US Big Boy as eyecatching, huge 10-wide model … but as stand-alone model only. The biggest steam engine in the world – the Big Boy – was allready build by serveral LEGO fans. But none of them used the old spoked wheels for the drive wheels and the large 1/4-panels to model the boiler. 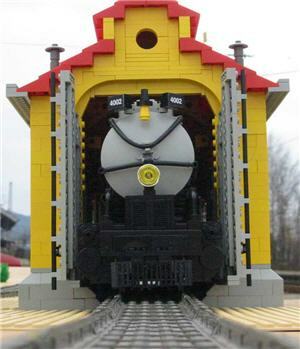 My Big Boy should fit in with my other 8-wide train models. First a stand alone model was planed, I didn't thought about going through curves with a 4-8-8-4 [2' D, D 2'] wheel arrangement. The tender in addition has got 7 axles. 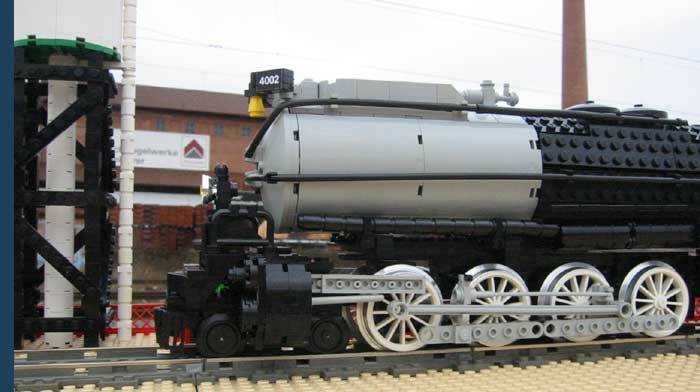 I really wanted to use the grey 1/4-panels to model the grey part of the boiler. Building a closed cylinder wasn't possible because of the chimney. So I could only realise this with a SNOT/Offset solution. 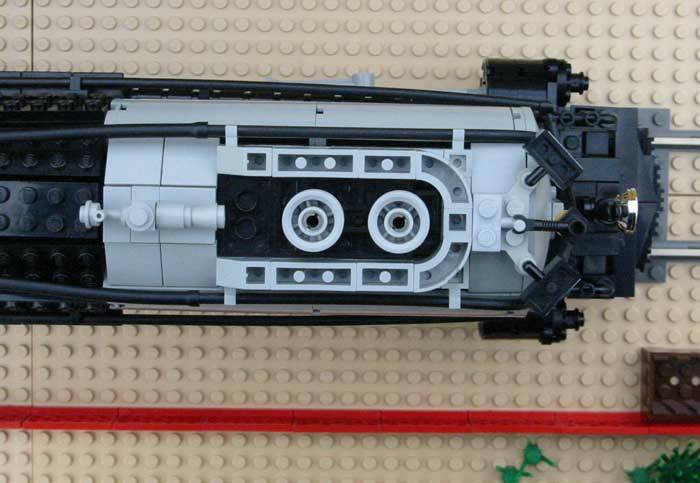 The black part of the boiler is build with normal 2xn plates using Minifig legs to "bend" them. A 1 metre (~ 128 studs) long model can't go through curves. That was my idea when I started constructing the drivers. But I didn't fix the axels and gave it a chance. The spoked wheels (with the aluminium rims known from my BR 10) in fact can steer and the whole model can go through curves! The picture below shows the piviot mechanism of the two major drives and the contected front and end 2-axle truck. 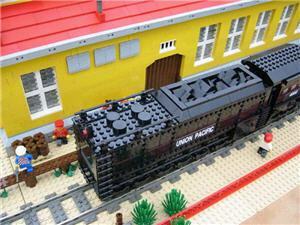 After building the locomotive's drivers it was easy to realise the 7-axled truck from the tender. The side walls are build in SNOT (similar to the BR 101). Just see the some detailed pictures. I even didn't forget the bell and the large headlight. The picture shows the piviot mechanism of the drivers and the fixing points at the boiler. 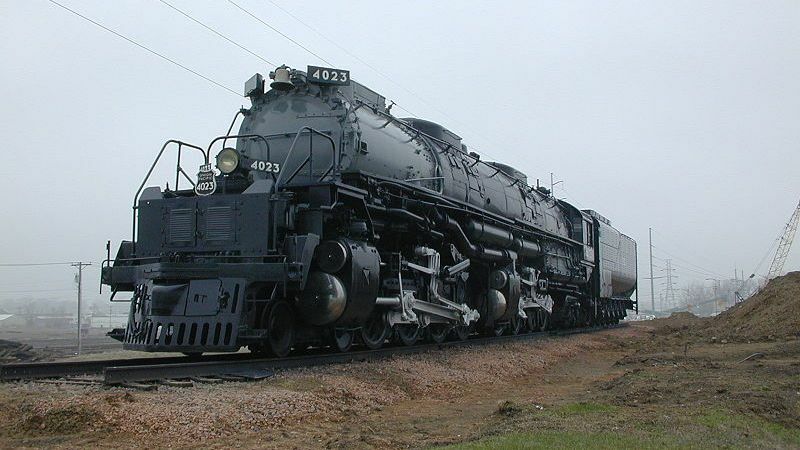 The Union Pazific Big Boy was build as Class 4000 by the American Locomotive Company in the 1940's. 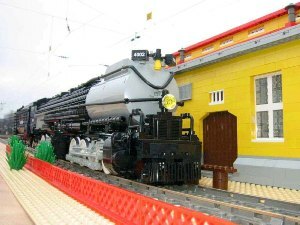 Using such a big engine made it possible to climb the step ramps in Wyoming using just a single locomotive. Many smaller steamers – which were not very cost efficent – got useless. Former they were needed to pull the 4200 tons heavy freight trains up the ramps. The first series build had the numbers 4001 to 4019, 1944 a second series followed with the numbers 4020 to 4024. The maximum speed is calculated as 70 mph (112 km/h) – in service it was only 15 to 40 mph pulling uncountable freight cars. Each Big Boy made over 1.000.000 miles till 1958 when the last Big Boy was put out of service.